Make a grand entry at the party with a perfectly contoured and glowing face. 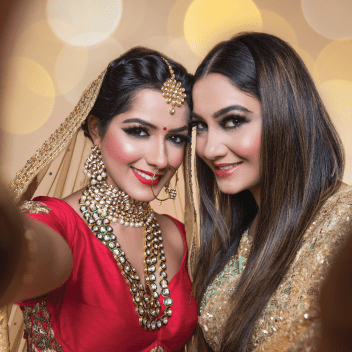 Click perfect selfies and have a glam look. No need to make time for makeup salon, get all the professional services delivered to your home. We, at UrbanClap, have the top makeup artists in Ahmedabad who are creative, experienced, innovative and provide the best party makeup in Ahmedabad. What you need to do is enjoy and we will take care of all your party makeup needs. 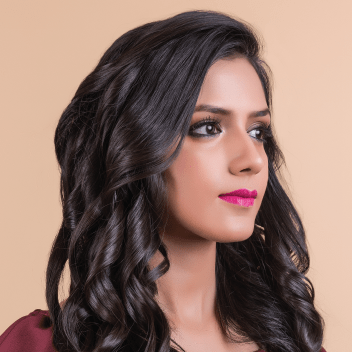 Connect with us on UrbanClap for availing the services of the top makeup artists in Ahmedabad. She made me look lovely on my God bharai, very skilled, I have small eyes but she made the eyes look pretty. But only one issue I had there were lots of hidden pricing, like for hairstyle she charged 300 RS extra for Bun, which should be included in hairstyling, 300 RS extra for eye lashes which should be included in the package. For draping I had paid then also I had to give safety pins. To get a fantastic makeup look for any special function whether it’s someone’s wedding, or your anniversary, a trained and professional makeup artist can bring a lot of difference. Your pics will come out great if the makeup is properly applied by an expert MUA. An experienced makeup artist is able to produce a makeup look that lasts longer. A good MUA can also give you a perfect base that you may find it arduous to do it by yourself. Skilled Specialists: UrbanClap has the finest party makeup artists in Ahmedabad who are proficient and certified. Quality Makeup: UrbanClap’s expert makeup artists solely use authentic products. Convenience: UrbanClap will send a fine makeup artist with all the necessities to your own house. Rapid Service: Just book up to 3 hours before the special event and be garbed at your home. Since dry skin is the main reason for the makeup to be flaky, moisturising primes the face and the makeup can be applied easily. Let the party makeup artist know your style choices by providing her some photos of several makeup looks and hairstyles as references. Depending on your skin type, your face’s shape, and your dress, MUA can suggest you which style would complement best. 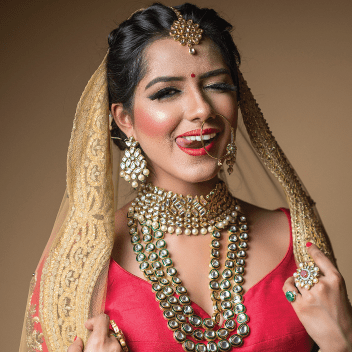 Share with the MUA a couple of photos of various styles of draping as references, when you have to get draped in your dupatta or sari. Your makeup will get spoiled if you change after the makeup is applied. Wear the blouse first and then sport a top or a button-down shirt to avoid ruining it. Make sure to pack your footwear, jewellery, button-down shirt, and your dress for the occasion if you are getting prepared at a venue. The MUA will use your favoured makeup product if you ask her, so bring it to the makeup session. For slight touch-ups at the venue where the function would take place, you can always make a small touch-up kit that has the foundation, concealer, moisturiser, lipstick and pins. If you are getting a facial treatment done prior to the makeup, do it 2 days beforehand. Make the MUA look at some photos of your choices of style and speak to her about them. Don’t ask for changes after the makeup session is over. If you have any qualms, let the MUA know while the makeup application process takes place. There may not be time left to repeat the makeup. Convey your aversions openly with the MUA. Let's say, you don’t prefer a dramatic winged eyeliner or eyelash extensions. You should tell her directly. The MUA would appreciate it. Check your makeup look in natural and artificial lighting settings by clicking your photos. You need to ensure that the base matches the colour of your skin. The back, neck and face should be of the same tone or else, the MUA can apply foundation on the visible parts. Your MUA can fix the flaky areas of your makeup by delicately dabbing some moisturiser on the dry regions. Ideally, you should not conceal the acne marks, and blemishes along with pimples entirely, as you may look odd. Just check whether they are concealed enough. The makeup artist can make the makeup bold or moderate if you think it is not coming up according to your expectations. For your kajal to last long, dry your waterline with a cotton bud before the kajal is applied. Your makeup lasts longer when the primer is applied on not just your face but also above the eyelids before applying makeup. If the pins are pulling your hair during the hairstyling process, ask the hairstylist to change the position of the pins so that you are comfortable. To know if your hairstyle holds up correctly, just move your head around and check whether it is not opening up. For sari draping, see whether it’s comfortable and check if the sari does not open up while you stand or sit. Also, move about to check if the pleats don’t open.